For reasons best known to the company, Samsung decided to restructure its popular Galaxy A series for this year. 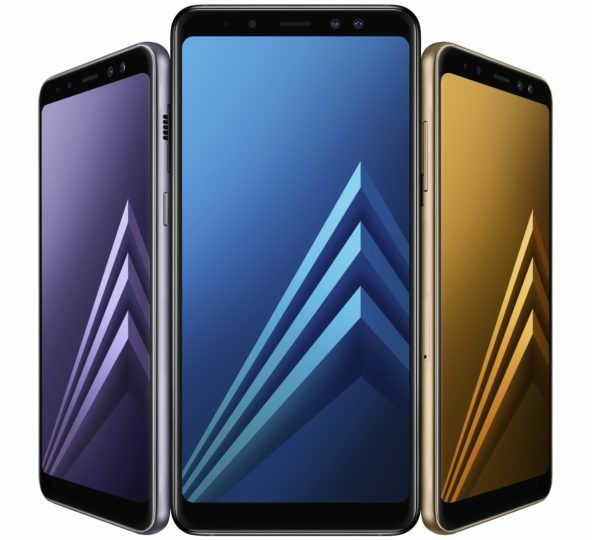 The medium sized model previously referred to as the Galaxy A5 has been released as the Samsung Galaxy A8 (2018). As the naming suggests, this device is basically the mid-range version of the Galaxy S8, and that’s a burden that it carries with grace. The Galaxy A8 (2018) sticks to the formula that has worked well for this premium mid-range series over the past couple of years. The handset has a metal and glass build which provides a premium look and feel. Weighing 172g and measuring 149.2 x 70.6 x 8.4mm, the Galaxy A8 (2018) has a 5.6-inch 1080x2220 pixel resolution Super AMOLED display with 18.5:9 aspect ratio. The handset is IP68 dust and water resistant. This is the first mid-range handset from Samsung to feature an Infinity Display. While it doesn’t have curved edges, it’s firmly entrenched in the bezel-less territory. This also means that the handset doesn’t have a physical home button anymore and the fingerprint sensor can now be found below the camera on the back. The Galaxy A8 (2018) is powered by a Samsung Exynos 7885 octacore processor with 4GB of RAM and 32/64GB storage options. It's coupled with a Mali-G71 GPU. The storage can be expanded up to 256GB with a microSD card. It also supports LTE Cat.11, Wi-Fi 802.11 ac and Bluetooth 5.0. It’s also the first premium mid-range handset from Samsung to support the Gear VR headset. Names may change, but Samsung's software policy does not. Ergo, the Galaxy A8 (2018) runs the not-quite-recent Android 7.1.1 Nougat out of the box, with the Samsung Experience 8.5 UX on top. Looking at the update track record of comparable models, we expect the new A8 to receive monthly security updates for at least two years, plus two big updates for the Android operating system. The first of these will be the update to Android Oreo which should arrive later this year. The Galaxy A8 (2018) is a device of firsts for Samsung. It’s the first mid-range smartphone from the company to feature a dual front-facing camera. Samsung has been highlighting this major selling point in its marketing materials for the handset. It features a 16-megapixel primary front camera with f/1.9 aperture coupled with a secondary 8-megapixel f/1.9 camera with support for Live Focus. Users can easily switch between taking regular photos or close-ups with background blur. There's also a 16-megapixel f/1.7 camera on the back with video digital image stabilization and a Hyperlapse mode. The Galaxy A8 (2018) has a non-removable 3,000mAh battery, that’s the same capacity as its predecessor. We had no qualms with the Galaxy A5 (2017)'s battery life so if further optimizations have been made, the new handset should be able to get you through the day easily, and then some. The Galaxy A8 (2018) was officially announced in the last week of December 2017. Samsung started selling it in markets like Vietnam, South Korea and the Netherlands in the first week of January 2018. It will be rolled out gradually in other markets in the weeks to come. It costs €499 in the Netherlands. That's just a hair under $600. It's slightly more expensive than the Galaxy A5 (2017) which was sold for €429 or $515 last year. Prices vary by market but this is a good baseline to keep in mind. The Galaxy A8 (2018) will cost about the same in your market when it arrives.